Director Dexter Fletcher revealed that facts may not always matter in bringing the gay singer's life to the big screen. In a fantastical scene from Rocketman — the upcoming biopic of Elton John — the gay singer plays "Crocodile Rock" for his opening number at the Troubadour in West Hollywood. The performance at the storied music venue so uplifts the crowd that they (and John) begin floating off the ground. This performance never happened — or not with "Crocodile Rock," at least. John did indeed make his U.S. premiere at the Troubadour in August 1970 in a six-night show that is credited with launching his decades-long music career. However, his first tune at the Troubadour was "Your Song." "Crocodile Rock" wasn't penned until 1972. And of course, no one was physically floating at the time. Director Dexter Fletcher acknowledged this historical inaccuracy at a Monday preview of Rocketman, which showed select scenes from the forthcoming film. Fletcher, since he was working to finish the production, was not physically present at the Troubadour — where stars like Patrick Stewart, Darren Criss, and Kelly Osbourne had gathered to see the reel on the (almost) 50th anniversary of John's legendary performance there. A letter from Fletcher was read aloud by Taron Egerton, who portrays John in the film. The format of the film also speaks to this "artistic license." 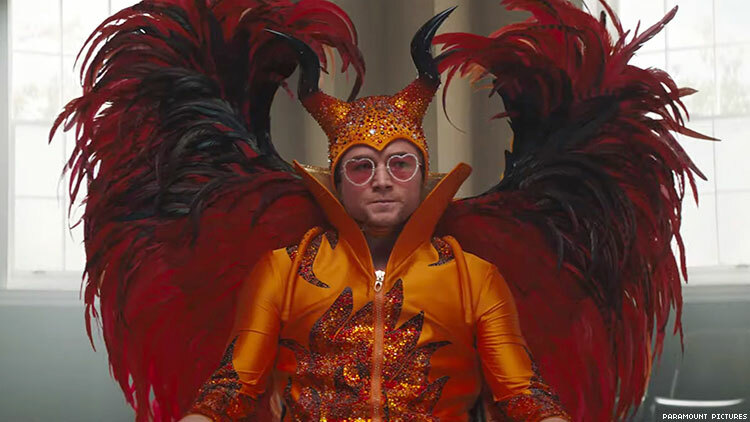 Rocketman — in the 10-minute presentation shown to the press, which included the Troubadour scene — shows characters breaking into song in a restaurant or on a street in the style of a stage musical, complete with backup dancers and fantastical special effects. As Fletcher noted in his letter, the special effect of floating is symbolic of the journey the young singer was embarking when he first set foot in the Troubadour. "Pretty much 50 years ago, Elton stepped out onto this stage into a new world and flew," Fletcher stated. "He’s still flying now and radiating all of his light and magic that launched at the Troubadour in 1970." This artistic approach contrasts another biopic of a queer musician, Bohemian Rhapsody — Fletcher was the replacement director after Bryan Singer was fired — which presented its musical numbers in a more realistic manner, such as onstage or in a recording studio. Notably, Bohemian was also criticized by members of the LGBTQ community for how it revised history. For example, the film changed the date of the Queen front man's HIV diagnosis to suit dramatic purposes. In this light, the note can be interpreted as a disclaimer that Rocketman — with the blessing of John — will not always stick to the facts in service of a finding an emotional truth, which includes several flights of fantasy. Fletcher, 53, has worked most of his entertainment career as an actor in films like Lock, Stock and Two Smoking Barrels and the HBO drama Band of Brothers. He began directing in 2011 with Wild Bill, followed by Sunshine on Leith and Eddie the Eagle, which also starred Egerton. Egerton's own career seemed poised for flight Monday at the Troubadour. Standing next to John's husband (and Rocketman producer), David Furnish, as well as castmates Jamie Bell and Bryce Dallas Howard, the 29-year-old actor seemed in disbelief that he was the star of John's biopic. "I’ve got a funny feeling that I may have peaked," he said, right after spotting a famous face in the audience. "Oh, my God, it’s Patrick Stewart!" he exclaimed. Egerton also thanked John, Furnish, and Rocket Entertainment “for constantly making me feel like I could do this … when I really didn’t feel like I could." Rocketman, which is distributed by Paramount Pictures, premieres May 31 in the United States. Watch the trailer below.